Posted: 2006.12.27(Wed)12:04 Post subject: X-ray fish? Hi there I bought two of these today thinking they were x-ray tetras but looking at photos on the net they aren't but any internet search I do on x-ray fish only brings up x-ray tetras. Do any of you know what this fish is and where I can find some info on it? Whatever it is, pretty sure it's painted. nope, those are not x-rays, since I'm the owner of 3 x-rays, I am certain. X-Rays are also called Pristella Tetra, you can find out about them on the Gallery page. Pristellas are very nice fish, I have a few. Glass Catfish are beautiful too, if you're interested in see-through fish, but they are kind of finicky. its horrible that they do that to those poor tetras, I would never support people enhancing fish for colors, they weren't made to be colorful, and injecting them tetras or any fish is horrible there should be a law for this, it kills the fish and a lot of people do not know this they think that the fish has some bright colors in it. It's animal cruelty, I think the glass tetras are cool the way they are. It's sad that people buy dying fish and these poor fish suffer. Its just awfull, I think what makes these glass fish beautiful is their transparency not their painted colours. 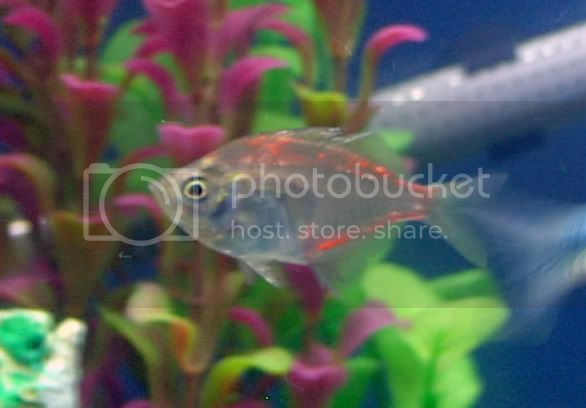 This fish isn't a tetra its an indian glass fish. I looked on a couple of sites and unfortunatley its one of the fish that is most frequently injected with dye. Did you get the fish in a chain store or in a small locally owned place? If you got it at a locally owned joint, you should talk to them. Death By Dyeing runs a thing where they offer a list of all fish stores that don't dye fish. It's free advertising on a popular web site (not to mention good karma) if your store is willing to dump the dyed fish. I like it because it doesn't have a list of "stores to avoid", just a list of stores to patronize.